Wisdom Teeth Extractions - Michigan City Dental, P.C. | Michigan City Dental, P.C. Wisdom teeth are the last set of molars. They usually come in when you are a teenager, though many start to come in when you are in your twenties. 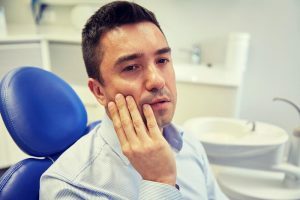 In the end, whether you need to have your wisdom teeth removed is a decision you will need to make after speaking with your dentist. But if you notice any of the following signs, that conversation about your wisdom teeth can’t wait until your next scheduled appointment. Pain is one of the most obvious signs your wisdom teeth may need to be removed. You may notice pain either along your entire jawline or just in a single location in the back of your mouth. You may also develop painful or bleeding gums. Quite often the pain is most acute while eating or brushing, but sometimes you can experience a high level of pain throughout the day. Jaw stiffness is common when there are problems with your wisdom teeth. Whether your jaw feels sore or you are unable to open your mouth as wide as usual, it may show you should have your wisdom teeth removed. This soreness occurs when emerging wisdom teeth crowd and shift your existing teeth. If left untreated, your teeth will shift and may become crooked. Constant colds, headaches, and sinus infections are a clear signal you have a dental problem. Your oral and nasal cavities connect. When you have any upper wisdom teeth issues, you can usually feel sinus pain or pressure. After having your wisdom removed, your sinus pain should disappear. The development of oral cysts around your wisdom teeth is a dangerous sign you need immediate treatment. When a tooth does not emerge completely from the gum line, dentists say it is “impacted”. When a wisdom tooth is impacted, the sacs near the tooth may fill with fluid which can lead to an infection. When this occurs, a cyst can form. Oral cysts, besides being painful, can lead to permanent jaw and tooth damage.